There are few people in this world that I have ever really admired as people. Don Bradman, the cricketing guru who helped Australia recover from the Great Depression, Gough Whitlam, the politician who upon becoming the Prime Minister of Australia in December 1972 released Australia from the rule of conservatives and Jacques-Yves Cousteau, the inventor of scuba and explorer of the oceans are three of my four heros. The final person to make up this quartet was Lloyd Bridges. Why would Bridges, an American television and film actor be a hero to a person who lived so far away in Australia? Lloyd Bridges was born on 13 January 1913 in San Leandro, California. His family included entertainers (and even jugglers) but his mother and father did not want him to go into the entertainment business. They wanted him to become a lawyer and so, after school, he entered the University of California, Los Angeles (UCLA) where he studied law. Bridges decided to pursue this appointed course and apparently it was not until he studied constitutional law that he changed his mind. He completed his degree but then moved to the East Coast where he started acting in small threatre companies. In the 1930s he directed and starred in a modern version of Shakespeare's Othello, playing Iago. He and his wife, Dorothy, also taught drama. In 1941 he was signed to a studio contract by Columbia Pictures who used him in supporting roles. He was never a leading star, and I do not recall any film in which he was the main actor. In the 1952 western classic High Noon, Bridges starred opposite Gary Cooper as the deputy sheriff. Despite this role, his star did not climb any higher in films for a long time. Bridges was a supporter of radical causes, perhaps that is one of the reasons why I admire him. In the early 1950s, probably 1953, Bridges was called before the Un-American Activities Committee, headed by Senator Joe McCarthy, (many people will recall Arthur Miller's play The Crucible -1953 - which although concerned with the Salem witchcraft trials, was actually aimed at the then widespread congressional investigation of alleged subversive activities in the United States). At the committee's hearings, Bridges was alleged to have been a Communist. Unlike many other film stars called before the committee, Bridges did not recoil from the truth and admitted that he had been a member of the American Communist Party. He was offered some roles in the new television industry, and in 1957, the year I was born, he was given the role that was to make his fame, Mike Nelson. As Nelson, a former United States Navy frogman, Bridges travelled the south-eastern part of America and the Carribean as a do-good underwater "sheriff". Sea Hunt introduced millions of people all over the world to the new activity of scuba diving. I was too young to watch Sea Hunt as a first run TV show but in the early 1960s I remember watching his adventures on afternoon TV. Who will ever forget Mike Nelson wrestling with some crook before getting his air hose cut (as a scuba diver I now know that it was the exhaust hose that was cut making a lot of show but no danger). The show ended in 1961 after 156 episodes, not because the ratings decreed it so, but because Bridges attempted to move the show into fighting enviornmental issues. He once stated that "I wanted [the show] to look at the real villians of the sea, like the oil companies". He refused to be compromised and the producers of the show refused to change (they wanted more of the same) so Bridges quit the show. For a long time after this, Bridges was typecast as the adventurer Mike Nelson. He was later to comment that he thought he could play Hamlet better than Richard Burton, do Othello better than Jose Ferrier but of course no-one was ever going to offer him these roles now. "The public seems to think of me as being under water" he said. On another occasion he said "If we could just get some way to do Hamlet underwater, I'd be happy." After Sea Hunt he did the Lloyd Bridges Show (I have never heard of this before) and then had a few lean years before doing Joe Forrester (a cop - 1976 - not too bad a show). In the 1980 comedy classic Flying High (overseas Airplane) and its follow up Flying High Two (Airplane 2), he played the chief air traffic controller who was seemingly addicted to every possible vice. Bridges stole the show, with his "I picked a bad day to give up...." lines going into 1980s vernacular. Lloyd Bridges had seemingly a perfect family life, married to the same woman for almost 60 years, two sons who also became very well known actors (Beau and Jeff) and, I think, a daughter. His sons not only appeared as kids in Sea Hunt, they acted in a number of movies with their father in the 1980s and 1990s. I learnt of the death of Lloyd Bridges on 11 March 1998 (he died on 10 March American time) while visiting my parents when my younger brother came out of his room having just heard on the radio that he had died. Like the deaths of Elvis and John Lennon, I will always remember where I was when I heard of Bridges' death. Right till the end, Bridges had kept working, even though he was now 85 years old. He appeared in a couple of episodes of Seinfield (made in 1997), the most recent one only aired in Australia a couple of weeks after his death. An episode of Seinfield, one of the last made, was dedicated to "...our friend Lloyd Bridges". There are two movies that he finished recently that are still to be released. One, Mafia, will start in Sydney in mid-August 1998. Some of us who watched Sea Hunt were so thrilled by Mike Nelson's exploits that we eventually took up scuba diving. The scuba industry recognised Lloyd Bridges' contribution to promoting scuba diving that he was elected to the scuba Hall of Fame a few years back. For the past couple of years I have been suggesting to Barry Andewartha and Belinda Barnes (of DIVE Log and Sportdiving) that they should invite Bridges to Australia to be the key speaker at their successful A Night to Remember nights. Unfortunately, this did not occur. 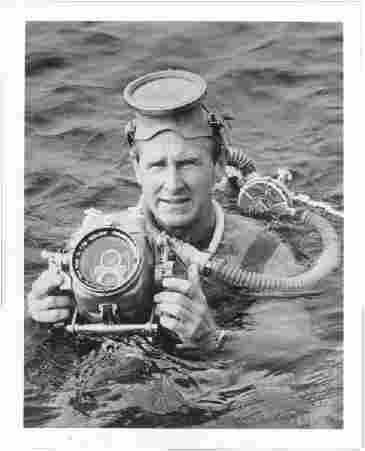 We as divers will be the poorer for the passing of Lloyd Bridges. Note: Copies of Sea Hunt are available on the Net. Use this link to get to the site. I just wanted to let you know that I too am a fan of Mr. Lloyd Bridges and that the world lost a great hero when he passed away. I happen to own the boat that Lloyd Bridges used as Mike Nelson in Sea Hunt. The boat was and still is called the "Argonaut" and is located in San Diego, Ca. I am curently restoring the boat and will be complete by summer 99". At that point the boat will make many special appearances and will be featured in many publications, I can't wait. I just wanted to say hi and to let you know that you are one of millions of Lloyd Bridges fans and as soon as I get the boat going I will create a place that all Sea Hunt fans to gather. I soon will post a site on the resoration of the boat and will continue this site to be used as a fan club.